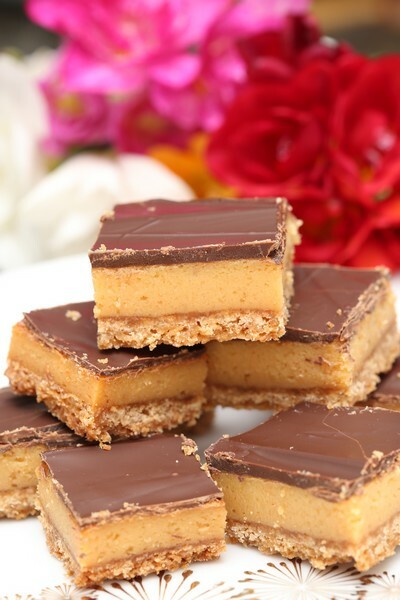 I was looking for a recipe for caramel slice and came across one on the internet that claimed it was the best ever caramel slice. Well, it’s a big claim, but I think it’s pretty high up there. Easy to make, super tasty – I won’t be looking for another recipe. This will be my go-to from now on. It’s great as it can be made in advance and I have had a lot of positive comments by people who have tried it. Most going back for a second (or third or fourth) piece. I’m sure you could easily make this gluten-free too by replacing the flour with gluten free flour. 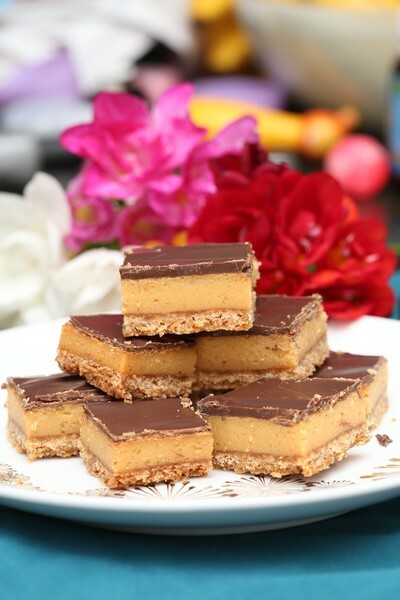 It makes a wonderful addition to a dessert table, as they can be cut quite small so people can have a bite and try other desserts too. 3. Place extra butter, NESTLÉ Sweetened Condensed Milk and syrup in a medium saucepan. Stir over low heat until smooth. Pour over base. Bake for 20-25 minutes until golden. Cool. 4. 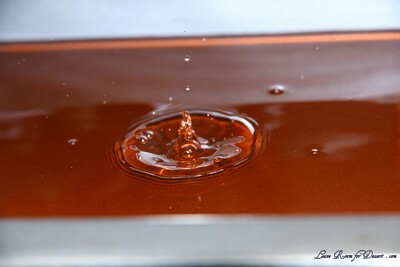 Combine PLAISTOWE Premium Dark Chocolate and oil, stir until smooth, pour evenly over slice. Place in fridge until set and then slice. (You may like to clean the knife between each or every couple of slices. a clean knife will give a cleaner edge). Nachos are a big hit with my family. Introduced to our family by Nick, they have become a regular favourite, so it’s great to put this recipe up on the site so everyone can enjoy it whenever they please. It’s a very easy recipe to make, we often have most of the ingredients on hand. Don’t be turned off making it if you were after one with meat, as it’s so delicious, you won’t even notice its absence. Combine salt, sugar and spices in a small bowl and set aside. Heat oil in a large saucepan over medium heat. Cook onions for 10-20 minutes (lowering temperature as needed), until soft and caramelized. 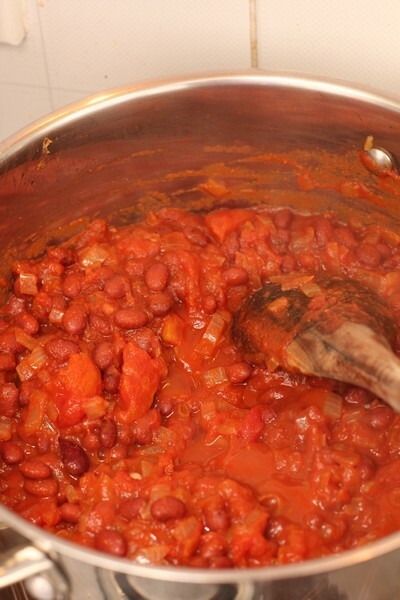 Add the tomatoes, kidney beans and spice mix to the onions and cook for 10-20 minutes on medium heat, until red kidney beans are softening. Roughly mash the mixture with potato masher. 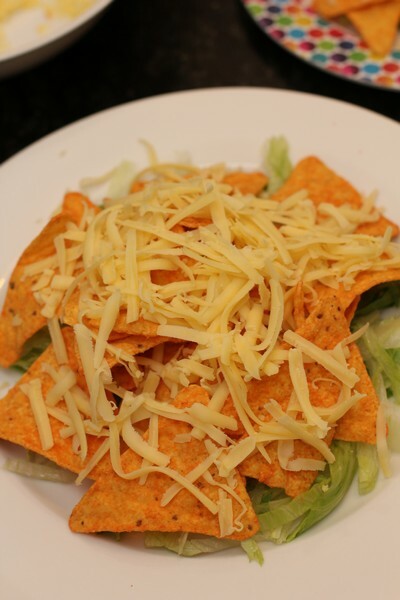 Place shredded lettuce on a plate, followed by corn chips and then cheese. 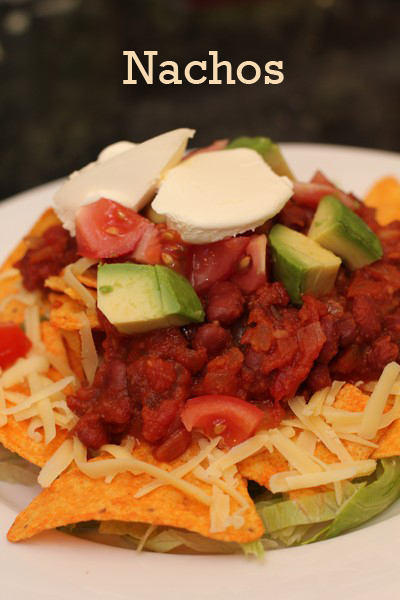 Place nacho mix on top and serve with sour cream, guacamole, avocado, tomato and jalapenos as desired. 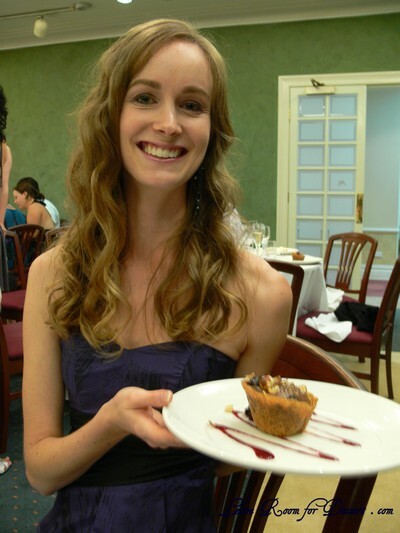 Sara and Erica of Baking JDs were our March 2012 Daring Baker hostesses! Sara & Erica challenged us to make Dutch Crunch bread, a delicious sandwich bread with a unique, crunchy topping. Sara and Erica also challenged us to create a one of a kind sandwich with our bread! It has been a few months of bread challenges for the Daring Bakers. I must admit I have really enjoyed trying all these new recipes, I know I never would had gotten around to making most of them, or even finding the recipes on the internet. We still have our sourdough starter, and it is really working nicely now, hopefully Nick will do a guest post on it in the future. 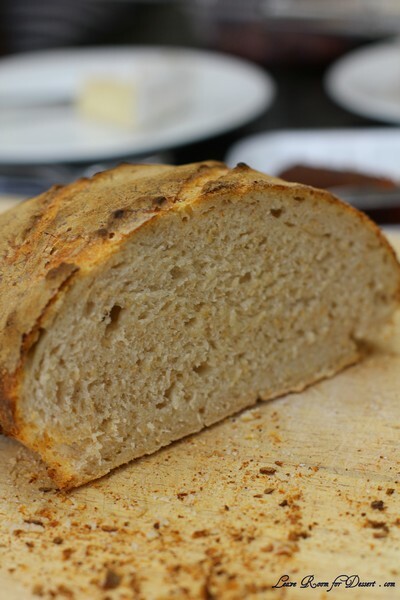 This month we had a few challenges, to make a bread, to use the Dutch crunch topping (also called Tiger bread due to its appearance once cooked), and the make a sandwich. I tried one of the bread recipes that was given as a suggestion, and it is one of the best quick breads I have made, with a lovely soft inside, I will be making it again. The Dutch crunch topping was very interesting to make, as it contains yeast and rice flour, and is like a bread dough in some ways. I used the suggested amount and had a nice thick layer on top of my bread. It came out lovely and crunchy. We used the rolls for sandwiches (I was going to use them as buns for veggie burgers, bit didn’t get around to making the veggie burger patties), and the loaf was warmed in the oven the next day and eaten with slow cooked beef in red wine with cous cous. I would also recommend eating it with olive oil, caramelised balsamic vinegar and dukkah. 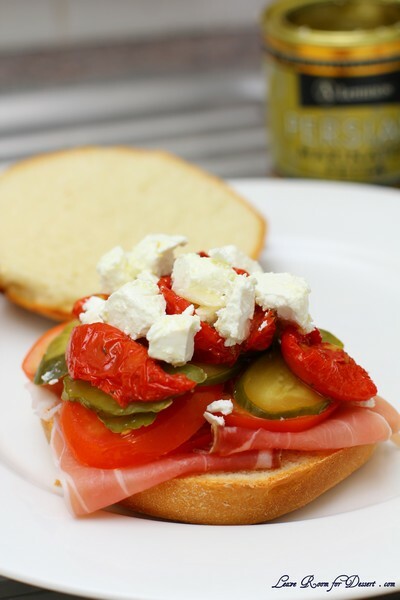 The sandwiches we made had proscuitto, tomato, sliced polski-orgorki pickles and semi-dried tomatoes, topped with Persian Feta. Recipe Source: The recipe for the Dutch Crunch topping came from Rose Levy Beranbaum’s The Bread Bible. The recipes for the breads we’ve suggested came from The Bread Bible and an adaptation of a recipe found on bakingbites.com (http://bakingbites.com/2006/09/cooking-school-dutch-crunch-bread/). Servings: This recipe should make sufficient topping for two 9×5 loaves (23cmx13cm) or 12 rolls. If you make only 6 rolls in the first soft white roll recipe, you can cut the topping recipe in half. 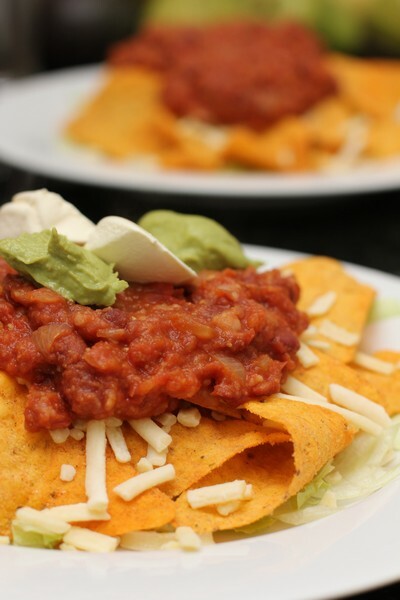 We’ve provided this recipe first because it is the mandatory aspect of the challenge. Note, however, that you should not prepare the topping until the bread you’ve selected to bake is almost finished rising (~15 minutes from baking). 1. Combine all ingredients in a large bowl and beat with a whisk; beat hard to combine. The consistency should be like stiff royal icing – spreadable, but not too runny. If you pull some up with your whisk, as shown below, it should drip off slowly. Add more water or rice flour as necessary. Let stand 15 minutes. 2. Coat the top of each loaf or roll with a thick layer of topping. We tried coating it with a brush but it worked better just to use fingers or a spoon and kind of spread it around. 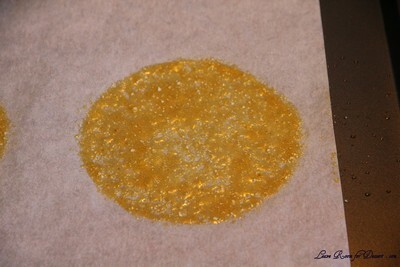 You should err on the side of applying too much topping – a thin layer will not crack properly. 3. Let stand, uncovered, for any additional time your recipe recommends. 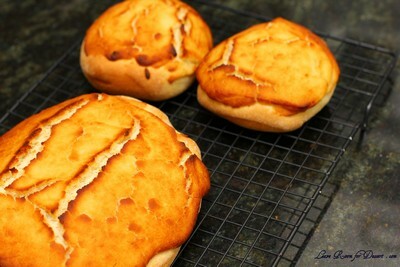 With the Soft White Roll, you can place the rolls directly into the oven after applying the topping. With the Brown Rice Bread, the loaves should stand for 20 minutes with the topping before baking. 4. 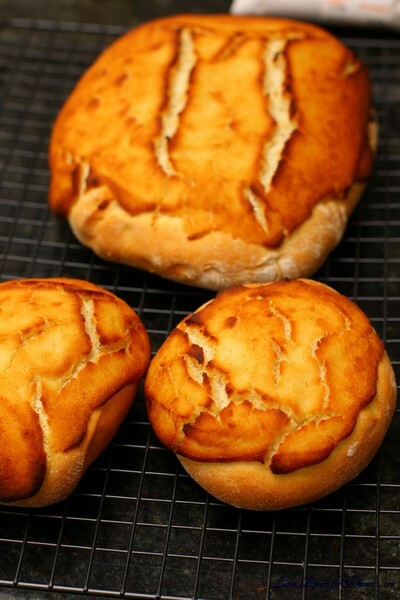 When baking, place pans on a rack in the center of the oven and bake your bread as you ordinarily would. 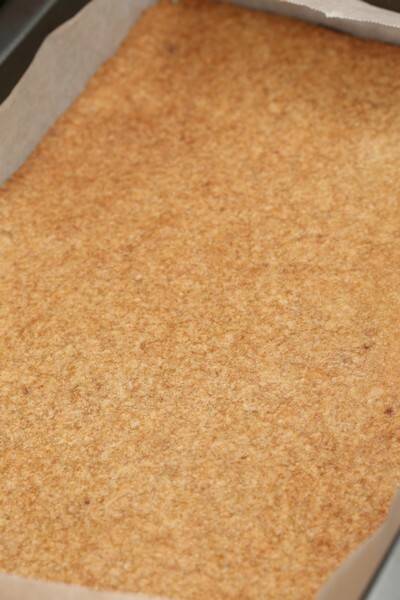 The Dutch Cruch topping should crack and turn a nice golden-brown color. 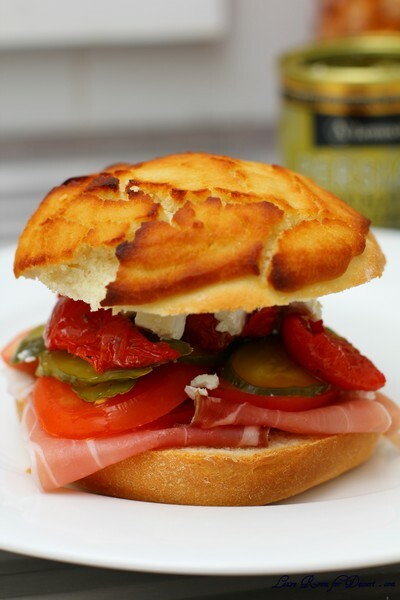 This recipe approximates the quintessential white sandwich roll found throughout the Bay Area. The recipe is simple, quick, and addictive. ¼ cup (60 ml) warm water (105-110º F) (41-43°C) (No need to use a thermometer – it should feel between lukewarm and hot to the touch). 1. In the bowl of an electric mixer or large mixing bowl, combine yeast, water, milk and sugar. 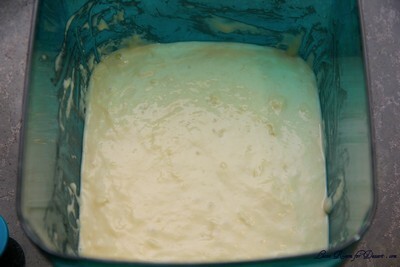 Stir to dissolve and let sit for about 5 minutes (The mixture should start to bubble or foam a bit and smell yeasty). 2. Add in vegetable oil, salt and 2 cups of flour. 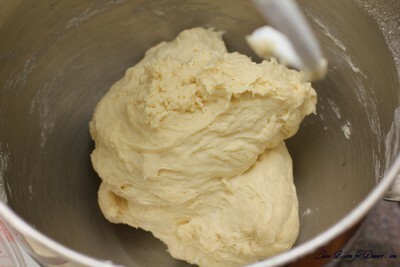 Using the dough hook attachment or a wooden spoon, mix at medium speed until the dough comes together. 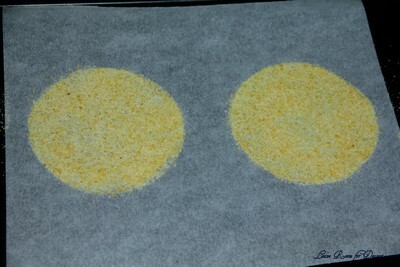 (The photo to below is with the first 2 cups of flour added). 3. Add remaining flour a quarter cup at time until the dough pulls away from the sides of the bowl, as shown in the photo below (For us, this usually required an additional 1½ to 2 cups of flour). 4. 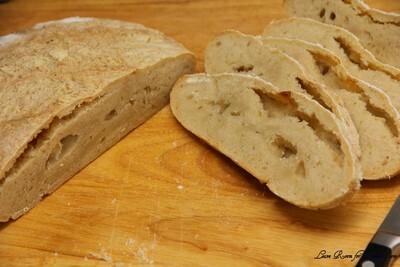 Turn out onto a lightly floured surface and knead for about 4 minutes, until smooth and elastic. 5. 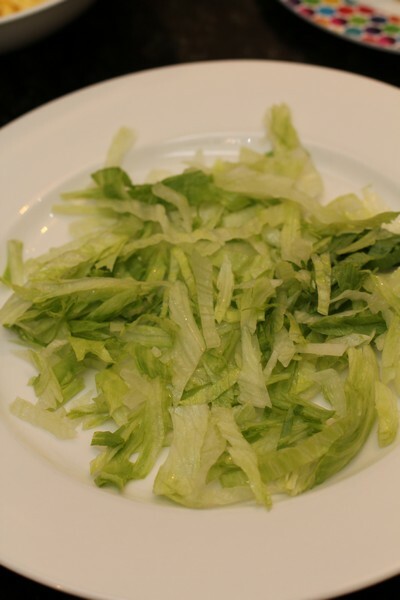 Place in a lightly greased bowl and cover with plastic wrap. 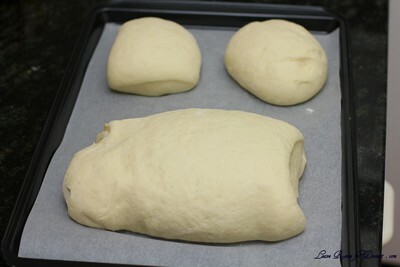 Let rise for 1 hour, or until doubled (or more) in size (see photo comparison). 6. 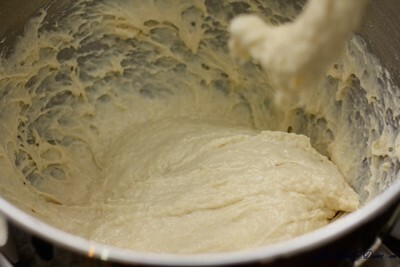 Once the dough has risen, turn it out onto a lightly floured surface and divide it into 6 equal portions (if you’d like to make rolls) or 2 equal portions (if you’d like to make a loaf) (using a sharp knife or a dough scraper works well). Shape each into a ball or loaf and place on a parchment-lined baking sheet (try not to handle the dough too much at this point). 7. Cover with plastic wrap and let rise for 15 minutes while you prepare the topping. 8. Coat the top of each roll or loaf with the topping as described above. While the original recipe recommends letting them stand for 20 minutes after applying the topping, I got better results by putting them directly into the oven. 9. Once you’ve applied the topping, bake in a preheated moderately hot 380ºF/190°C/gas mark 5 for 25-30 minutes, until well browned. Let cool completely on a wire rack before eating. Our finished products: Note the roll in the foreground on the left. This is what happens if you don’t put enough topping on the bread – no cracking! So be sure to load on the topping. I made the sourdough from the December Daring Bakers Challenge very soon after my last post about it. Although it did not really turn out particularly well, so I sort of held back on this post. And the next challenge is to be posted in tomorrow! Back to the sourdough. After having the sourdough starter go mouldy whilst I was sick, I made sure this one didn’t. 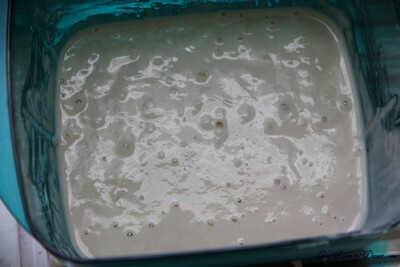 The starter was nice and bubbly and certainly smelt quite sour, so I was hoping I had nice active yeast in the mix. 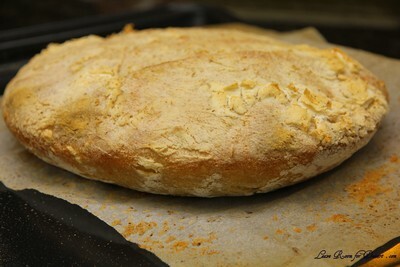 My first bread came out of the oven – and it hadn’t risen as much as I had hoped, I still crossed my fingers, although after cutting it through, we found it was still quite dough-y inside. Nice flavour, but texture was all wrong. I still have the starter dough though, and Nick has been making bread every weekend with it – although adding yeast to it – and it has been rising quite well. I wish I could part more information for you on troubleshooting, although as a newbie myself, I am just going to try and keep the starter and continue to feed it and hope the yeast becomes happier. At the moment I have it in the fridge, as I am a little scared I will forget about it on the bench and it will mould again. Even though the texture of this first bread was not so great, I still made the mushrooms from the given recipes and added some goats cheese on top, and you could hardly notice the bread’s heaviness once it was grilled and had a lovely topping on it. 1. In a Tupperware or plastic container, mix the flour and water into a paste. 2. Set the lid on top gently, cover with a plastic bag, to prevent messes in case it grows more than expected! 3. Set somewhere warm (around 86 F if possible). I sometimes put mine on a windowsill near a radiator, but even if it’s not that warm, you’ll still get a starter going – it might just take longer. 1. Stir the flour and water into the mixture from Day 1, cover, and return to its warm place. 1. Stir the flour and water into the mixture from Day 2, cover, and return to its warm place. 1. Stir the flour and water into the mixture from Day 3, cover, and return to its warm place. At this point it should be bubbling and smell yeasty. If not, repeat this process for a further day or so until it is! 1. Mix everything into a sloppy dough. It may be fairly stiff at this stage. Cover and set aside for 4 hours, until bubbling and expanded slightly. 1 ¾ cups (425 ml) (300 gm/10 ½ oz) production leaven – this should leave some (1 cup) for your next loaf. 1. 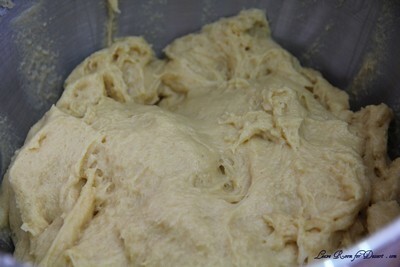 Mix the dough with all the ingredients except the production leaven. It will be a soft dough. 2. Knead on an UNFLOURED surface for about 8-10 minutes, getting the tips of your fingers wet if you need to. You can use dough scrapers to stretch and fold the dough at this stage, or air knead if you prefer. Basically, you want to stretch the dough and fold it over itself repeatedly until you have a smoother, more elastic dough. 4. Spread some water on a clean bit of your work surface and lay the dough on top. Cover with an upturned bowl, lining the rim of the bowl with a bit of water. 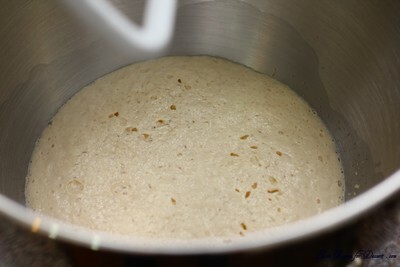 Leave for an hour, so that the gluten can develop and the yeasts can begin to aerate the dough. 6. Heavily flour a banneton/proofing basket with whole wheat flour and rest your dough, seam side up, in the basket. Put the basket in a large plastic bag, inflate it, and seal it. Set aside somewhere warm for 3-5 hours, or until it has expanded a fair bit. 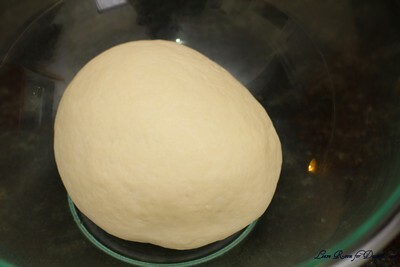 It is ready to bake when the dough responds to a gently poke by slowly pressing back to shape. 7. Preheat the oven to hot 425°F/220°C/gas mark 7. 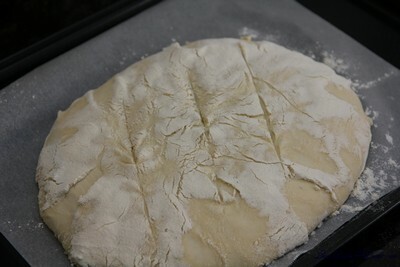 Line a baking sheet with parchment, then carefully invert the dough onto the sheet. I like to put the baking sheet on top of the basket, then gently flip it over so as to disturb the dough as little as possible. Make 2-3 cuts on top of the loaf and bake for 40-50 minutes, reducing the temperature to moderately hot 400°F/200°C/gas mark 6 after 10 minutes. 8. Cool on a cooling rack. 1. Preheat the oven to moderately hot 400°F/200°C/gas mark 6. 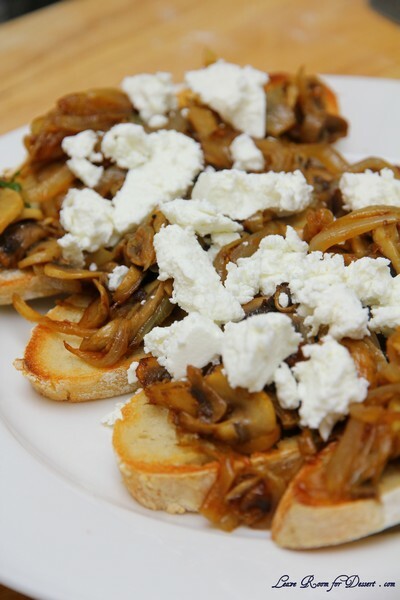 Place the mushrooms on an oiled baking sheet, with onion wedges scattered beneath them. Sprinkle over the garlic, oregano, and pancetta, drizzle with olive oil and season with black pepper and sea salt. Roast for 25 minutes until the mushrooms are tender. 2. Toast your bread in the toaster. Butter the toast, and then pile your mushroom mixture on top. A Twist: Instead of roasting your mushrooms, you can also sauté them in a pan and, just before serving, stir in a dash of cream for a rich, warm treat! Daylight savings has just begun, it is no longer dark when I get home from work (and only mildly darker when I leave). I am able to stop and smell the roses (and this is not just a saying in my case, as my first roses are opening for the season, and it just so happens to be a double delight rose). It is starting to feel like summer, with the all the extra light, although I would not wish Spring gone too soon – as it is my favourite season. 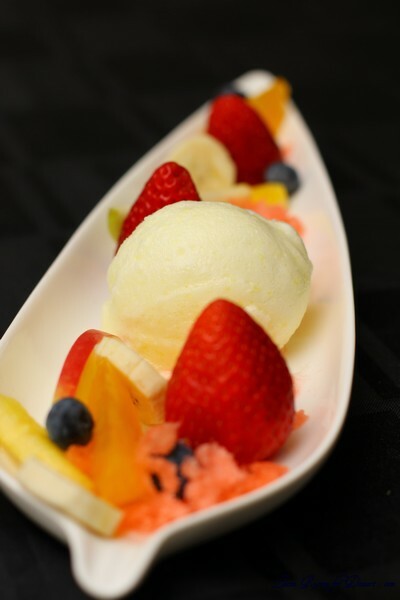 More fruits are coming back in season, and we can start eating icy cold sorbets again. 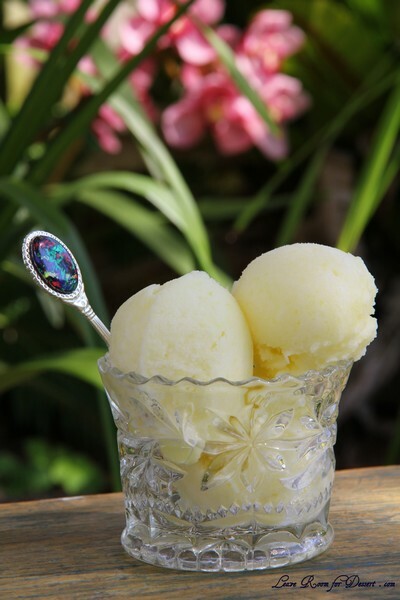 As pineapples are one of my favourite fruits, I started making this pineapple sorbet at least a year ago now. 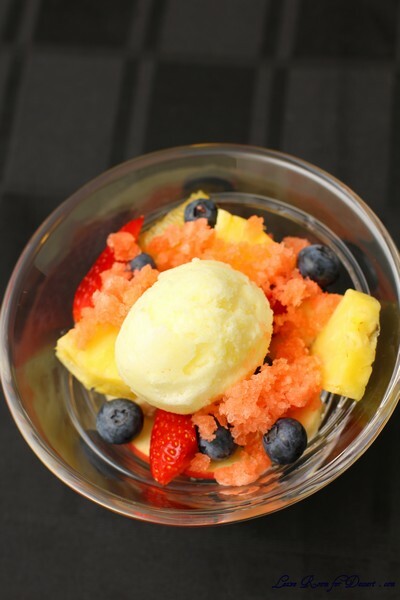 It can certainly be eaten by itself, although it also pairs perfectly with this refreshing tropical granita and the fruit salad. This is certainly a great way to make a fruit salad stand out a bit more and grab attention. I have tried to plate the fruit salad artistically. It is simpler to serve it in a bowl, but it looks very pretty this way. 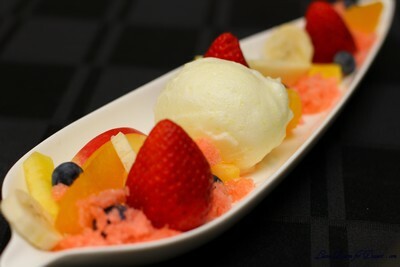 I have only tried the sorbet using an ice cream maker and it becomes almost creamy in texture. It’s amazing how the colour changes too, lightening up and becoming whiter as the mixture thickens. I am sure you could make it using the alternate method of removing the mix from the freezer and mixing it every hour for 3 or more hours and returning to the freezer. Although I am unsure as to whether it will result in the same creamy texture. I have also entered my Herb and Orange Chicken with Pineapple and Capsicum served with Pomegranate, Orange and Baby Spinach Salad recipe into the competition. Process the pineapple in a food processor. 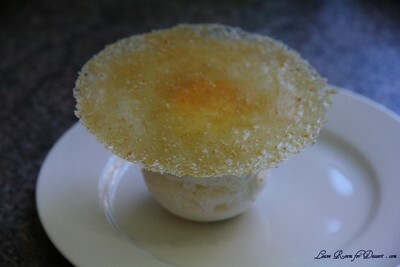 Place the pureed pineapple, sugar and water into a medium saucepan and cook on medium/high heat until the sugar is dissolved and the mixture comes to the boil (this may be difficult to see as the pureed pineapple can create a layer at the top). Boil for 5minutes, then strain into a bowl or jug. Allow to cool and refrigerate for a few hours or preferably overnight until very chilled. 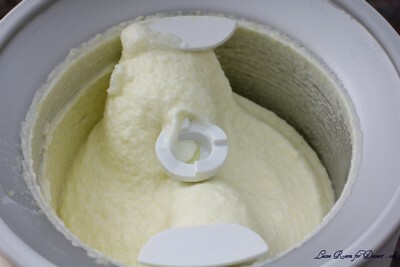 Churn in ice cream maker according to instructions of machine. Eat straight away or freeze in a sealable container until ready to serve. Lasts at least 2 weeks in the freezer. Process the pineapple and strawberries in a food processor. Place the sugar, water, passionfruit pulp and pureed pineapple and strawberries into a medium saucepan (you can use the saucepan that was used for the pineapple sorbet if you want to save on washing up). Bring to the boil on medium/high and continue to boil for 5min. Remove from heat and allow to cool. Place a piece of muslin cloth over a sieve, place this over a large pan that will take more than 1L of liquid (20cm x 30cm x 5cm). Pour the granita mix into the muslin cloth and allow the liquid to pass through. Use a spoon to help more liquid through, or use your hands to squeeze excess liquid out. If you don’t have muslin cloth, using a sieve on its own will work fine. Place the pan in the freezer until solid (overnight). 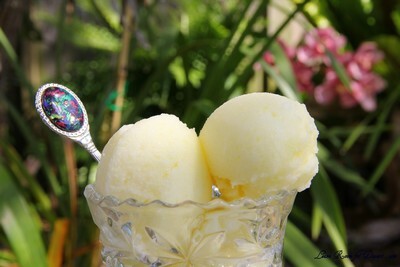 Use a fork to scratch the granita into fluffy ice crystals. Return to the freezer for another 2 hours (if longer, place in a sealed container) before serving. Mix all fruit together in a bowl or place artistically on a plate. 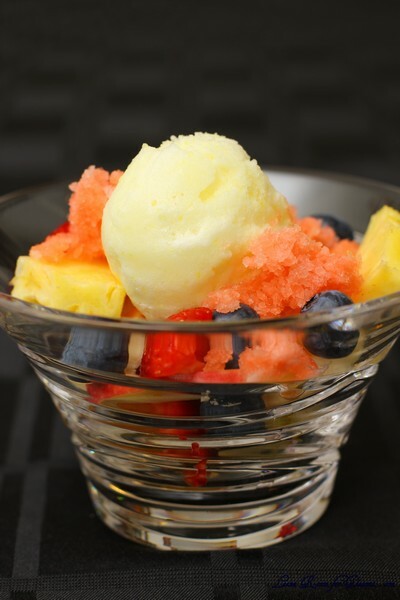 To serve the Pineapple Sorbet and Tropical Granita with Fruit Salad, prepare the fruit salad and place the pineapple sorbet on top. 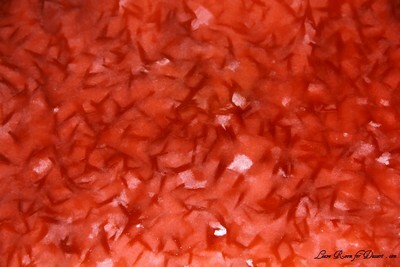 Place the granita on the fruit salad just before serving. Any component of this dessert can be served independently. There are some recipes that once tried, just need to be shared with others. 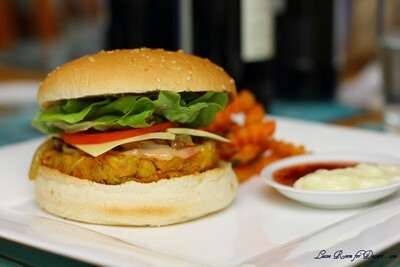 I love burgers, my Mum and Nick both make great beef burger patties, and I will often order chicken schnitzel burgers and beef burgers when out for dinner or lunch. 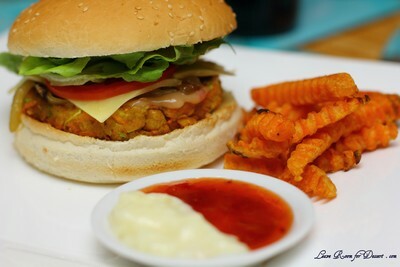 I never tend to buy vegetable burgers, as I’ve had a few dry and tasteless ones in the past. The patty was a little more delicate in structure than a normal patty, and this slightly worsened for the lunch meals, although perhaps we needed to pat out some of the liquid. Nonetheless – what an amazing dinner and lunch! Heat oil at medium heat in a medium saucepan, cook the diced onion, stirring occasionally until caramelised (will take about 10 minutes or more). Once caramelised, remove from heat and cool. 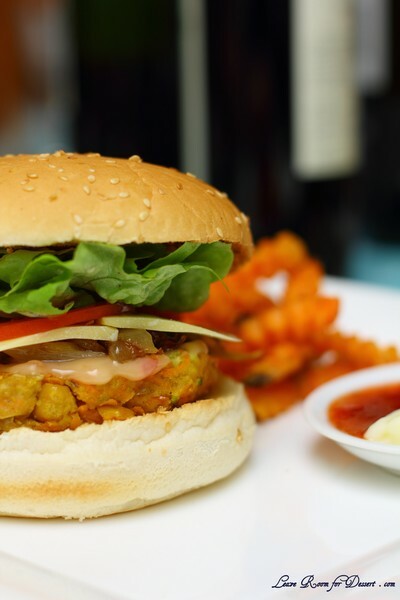 Make caramelised onions for on top of the patty in the same saucepan with the 3 sliced onions and extra oil (will take more than 10 minutes) – Allow this to cook on low whilst making the patty mixture. 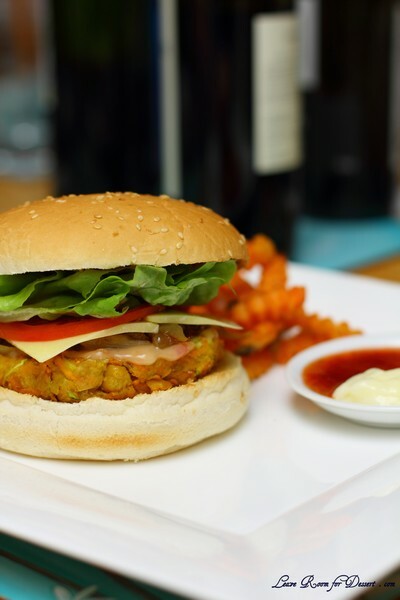 For the vegetable patty, mix the caramelised diced onions, chickpeas, sweet potato, zucchini, carrot, curry powder, vegetable stock powder, eggs and bread crumbs. Allow to stand for 10minutes, if the mixture is too moist, squeeze out excess liquid, or pat with a paper towel. Divide the mixture into 12 equal portions, roll and then pat into patties the same size/width as the burger buns. 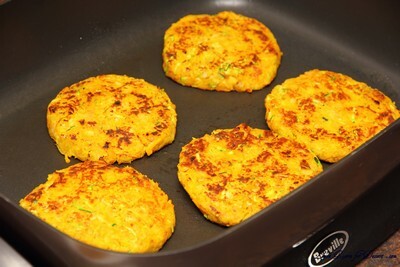 Heat a large saucepan or frypan on medium/high heat and cook the patties in a small amount of oil until cooked through, turning once the first side is nicely browned. 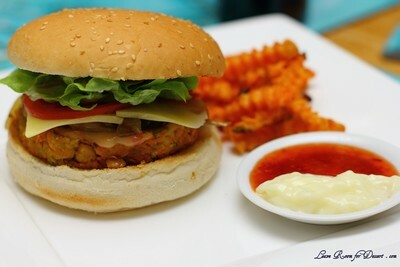 Place the cooked patty on a grilled burger bun and top with chilli sauce mixed with mayonnaise, caramelised onion, lettuce, avocado and tomato. 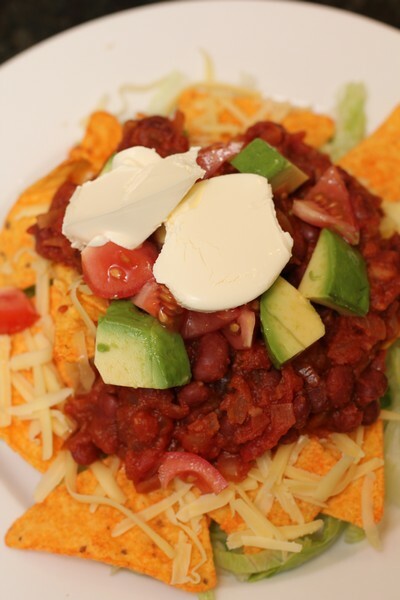 Serve with sweet potato chips or a salad. The 2010 December Daring Bakers’ challenge was hosted by Penny of Sweet Sadie’s Baking. 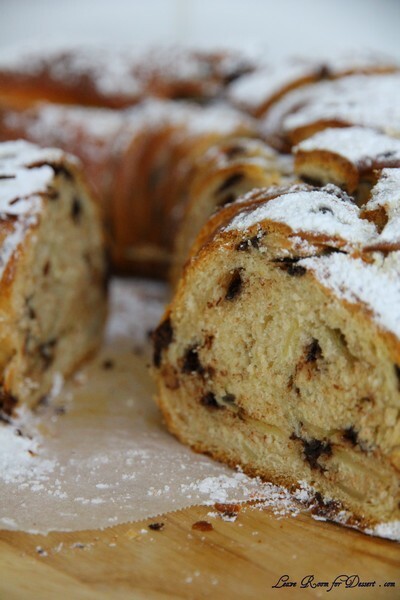 She chose to challenge Daring Bakers’ to make Stollen. She adapted a friend’s family recipe and combined it with information from friends, techniques from Peter Reinhart’s book………and Martha Stewart’s demonstration. We hosted a lovely lunch on Boxing Day this year. The day started off with rain, then went a little cold, got quite hot and then rained at night. I’m glad for the few hours of cool weather (we are currently experiencing a strange Summer here in Sydney), as we had the oven and BBQ on for the meals. We started with beautiful cheeses from Formaggi Ocello. For lunch we had gammon, lamb and roast chicken, with a garden salad, bok choy salad, pumpkin, beetroot and walnut salad. We had profiteroles, a triple chocolate cheese cake, a pavlova, fruit and berries, an almond slice and a chocolate chip stollen. This was the only opportunity for me to make this month’s Daring Bakers Challenge. The month has been full of Christmas and end of year parties and get-togethers, along with all the shopping for presents. I got some lovely cookbooks, clothes and a gorgeous Le Creseut pot. 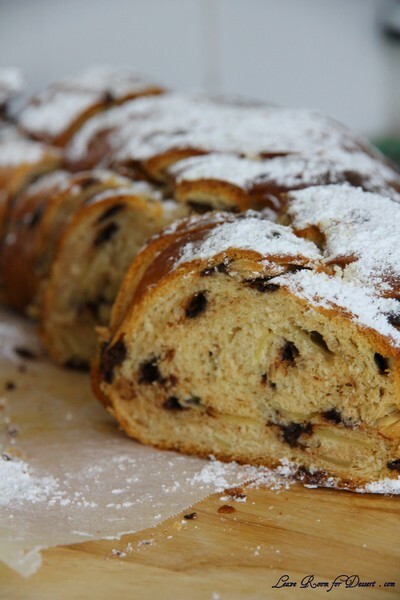 I considered making the stollen to the original recipe – as there are a couple people in my family who really enjoy fruit breads, although after taking a vote on whether to make the original version or a choc chip version – there was a resounding vote for the choc chip version. 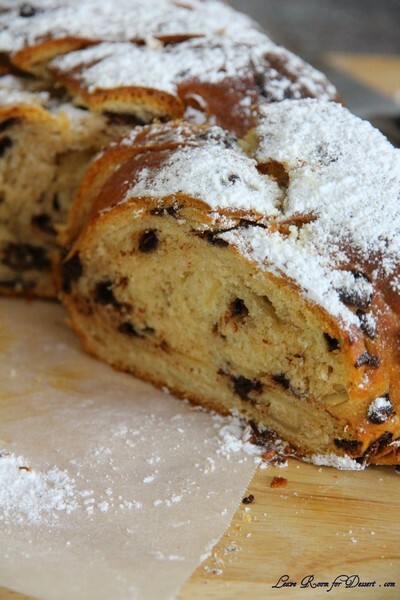 I thought it may turn out like choc chip hot cross buns – and it was quite similar. It was great an hour out of the oven and great toasted with a bit of butter a day or two after. Everyone was quite impressed with this as part of our dessert menu. I hope everyone had a great Christmas and have a fantastic New Years. 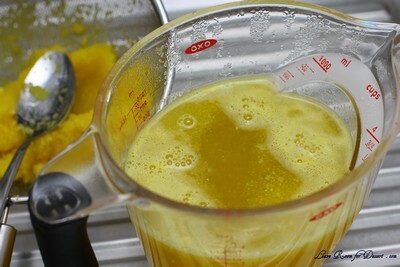 Note: If you don’t want to use alcohol, double the lemon or orange extract or you could use the juice from the zested orange. 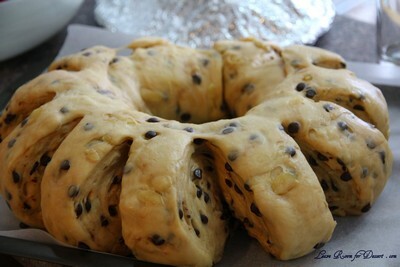 In a small bowl, soak the raisins in the rum (or in the orange juice from the zested orange) and set aside. See Note under raisins. Pour ¼ cup (60 ml) warm water into a small bowl, sprinkle with yeast and let stand 5 minutes. Stir to dissolve yeast completely. In a small saucepan, combine 1 cup (240 ml) milk and 10 tablespoons (150 ml) butter over medium – low heat until butter is melted. Let stand until lukewarm, about 5 minutes. 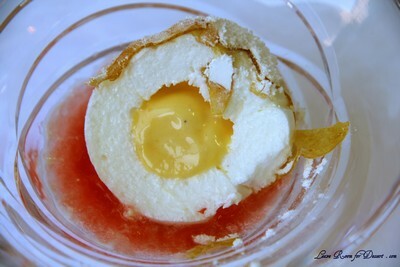 Lightly beat eggs in a small bowl and add lemon and vanilla extracts. In a large mixing bowl (4 qt) (4 liters) (or in the bowl of an electric mixer with paddle attachment), stir together the flour, sugar, salt, cinnamon, orange and lemon zests. Then stir in (or mix on low speed with the paddle attachment) the yeast/water mixture, eggs and the lukewarm milk/butter mixture. This should take about 2 minutes. It should be a soft, but not sticky ball. When the dough comes together, cover the bowl with either plastic or a tea cloth and let rest for 10 minutes. Add in the mixed peel, soaked fruit and almonds and mix with your hands or on low speed to incorporate. Here is where you can add the cherries if you would like. Be delicate with the cherries or all your dough will turn red! Sprinkle flour on the counter, transfer the dough to the counter, and begin kneading (or mixing with the dough hook) to distribute the fruit evenly, adding additional flour if needed. The dough should be soft and satiny, tacky but not sticky. Knead for approximately 8 minutes (6 minutes by machine). The full six minutes of kneading is needed to distribute the dried fruit and other ingredients and to make the dough have a reasonable bread-dough consistency. 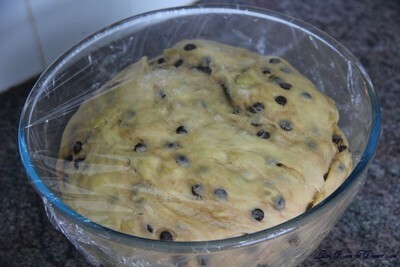 You can tell when the dough is kneaded enough – a few raisins will start to fall off the dough onto the counter because at the beginning of the kneading process the dough is very sticky and the raisins will be held into the dough but when the dough is done it is tacky which isn’t enough to bind the outside raisins onto the dough ball. Lightly oil a large bowl and transfer the dough to the bowl, rolling around to coat it with the oil. Cover the bowl with plastic wrap. Put it in the fridge overnight. 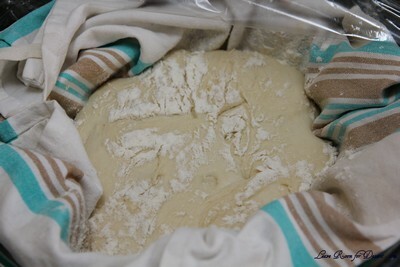 The dough becomes very firm in the fridge (since the butter goes firm) but it does rise slowly… the raw dough can be kept in the refrigerator up to a week and then baked on the day you want. 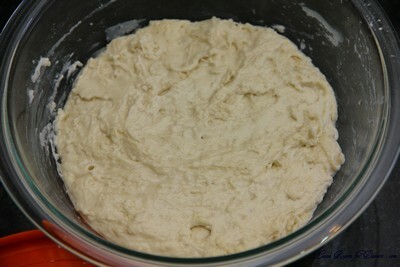 Let the dough rest for 2 hours after taking out of the fridge in order to warm slightly. Preheat oven to moderate 350°F/180°C/gas mark 4 with the oven rack on the middle shelf. 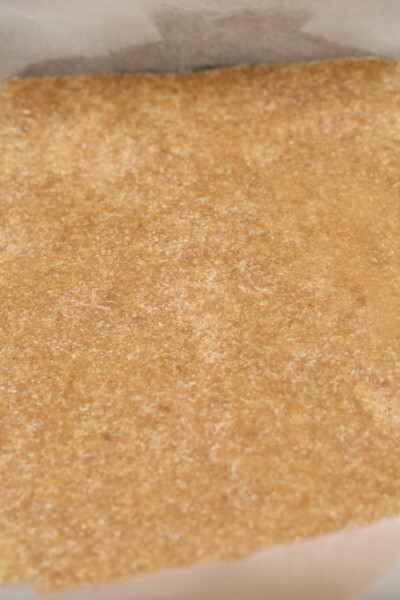 Punch dough down, roll into a rectangle about 16 x 24 inches (40 x 61 cms) and ¼ inch (6 mm) thick. Starting with a long side, roll up tightly, forming a long, thin cylinder. Transfer the cylinder roll to the sheet pan. Join the ends together, trying to overlap the layers to make the seam stronger and pinch with your fingers to make it stick, forming a large circle. You can form it around a bowl to keep the shape. Using kitchen scissors, make cuts along outside of circle, in 2-inch (5 cm) intervals, cutting 2/3 of the way through the dough. 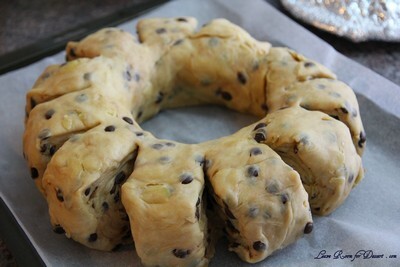 Twist each segment outward, forming a wreath shape. 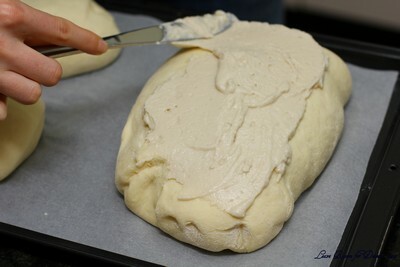 Mist the dough with spray oil and cover loosely with plastic wrap. Proof for approximately 2 hours at room temperature, or until about 1½ times its original size. Bake the stollen for 20 minutes, then rotate the pan 180 degrees for even baking and continue to bake for 20 to 30 minutes (Mine took approx 40min in total). The bread will bake to a dark mahogany color, should register 190°F/88°C in the center of the loaf, and should sound hollow when thumped on the bottom. 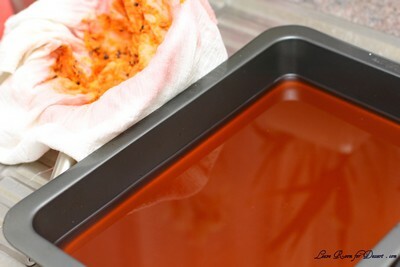 Transfer to a cooling rack and brush the top with melted butter while still hot. Immediately tap a layer of powdered sugar over the top through a sieve or sifter. Wait for 1 minute, then tap another layer over the first. The bread should be coated generously with the powdered sugar. Let cool at least an hour before serving. 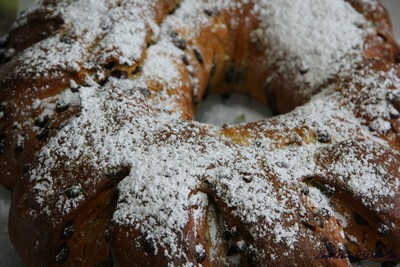 Coat the stollen in butter and icing sugar three times, since this many coatings helps keeps the stollen fresh – especially if you intend on sending it in the mail as Christmas presents! When completely cool, store in a plastic bag. Or leave it out uncovered overnight to dry out slightly, German style. The more rum and the more coatings of butter and sugar you use the longer it will store. 3. One month in the refrigerator well covered with foil and plastic wrap. Spring is almost over, before it even really begun. This year we had two lovely days of Spring weather at the beginning of September, followed by many days of rain, cold days and lots of windy days. This last week has been beautiful. Quite warm, but not too hot (I say this, even though I work in an air-conditioned building). Our garden is going crazy – plants and weeds alike. Three plants in particular are quite exciting at the moment: our fig, blueberry and raspberry. All three plants are in their second Spring season and are very happy, we have a number of figs forming, quite a few blueberries and many raspberries. One thing I didn’t understand when I bought the raspberry is the shop assistance’s advice: Watch out, the raspberry can take over… What? Isn’t that a good thing? Surely people aren’t unhappy about loads of raspberries. What he should have said was: Watch out, the raspberry sends suckers through the lawn and new plants shoot up more than one metre away from the original plant meaning you have no control of where are how far it will travel… Whoops!! Luckily running the mower over them have stopped new plants forming in the middle of our yard – I hope! Although my baking (and blogging) has been hindered by the lovely weather and constant maintenance of our yard, this recipe chosen for the daring bakers this month was great, as many components can be made the day or night before, and cooked while everyone is eating dinner. 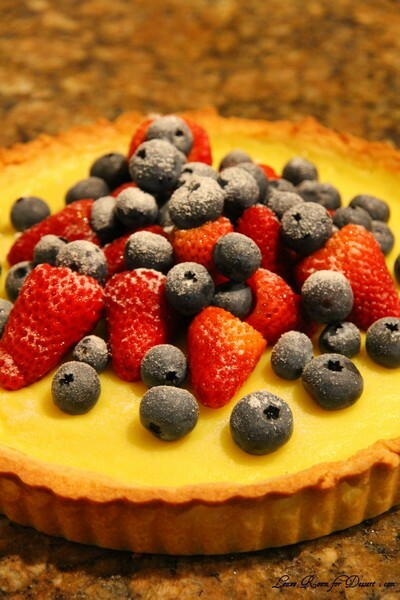 My family are huge fans of Portuguese custard tarts, so I had no trouble picking pastry cream to fill my tart shell. I must admit I used the food processor for the dough to make the tart shell. It seemed a bit dry and wasn’t coming together, so I added a touch more egg white (ok, accidentally – a bit more than a touch – making it a little too soft). 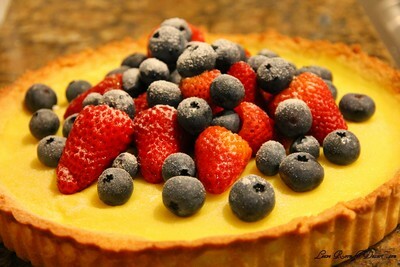 I didn’t blind bake my tart, I just added the pastry cream and cooked it for 40 minutes or more, until the pastry cream was set and the pastry golden. 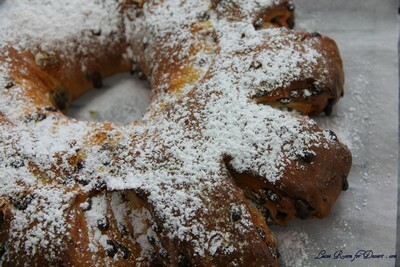 The pastry was lovely in texture and taste – very lovely. 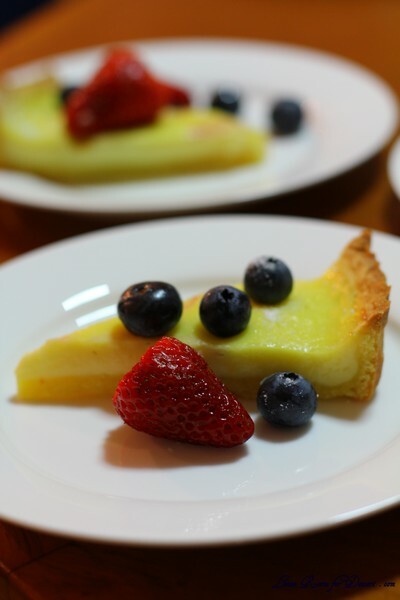 I thought I needed more pastry cream for the tart, although perhaps because the pastry was a little soft, it shrunk or fell a little at the sides, making it more level with the pastry cream when cooked. Thanks to our host for this month, for trialling so many recipes for people to choose from and be inspired from. Recipe Source: There are many recipes for pasta frolla and different ideas about how to make it. I will give you two versions that I have been using for some time. They have been inspired by those in the book La scienza in cucina e l’arte di mangiare bene by Pellegrino Artusi (1820-1911). The book was first published in 1891, and is available in English translation as Science in the Kitchen and the Art of Eating Well (further details are given in the Additional Information section). 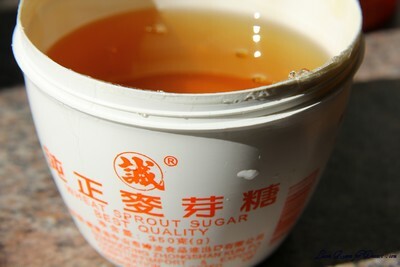 Note 1: Superfine sugar is often also referred to as ultrafine, baker’s sugar or caster sugar. It’s available in most supermarkets. If you cannot find “superfine” sugar, you can make your own by putting some regular granulated sugar in a food processor or blender and letting it run until the sugar is finely ground. Note 2: There are different ways of making vanilla sugar. 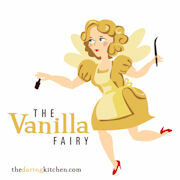 I keep vanilla beans in a jar half-filled with sugar until I need to use them, for example, to make vanilla ice cream. After I remove the split bean from the custard that will go into the ice cream maker, I rinse it, dry it and put it back in the jar with sugar. Whisk together sugar, flour and salt in a bowl. Rub or cut the butter into the flour until the mixture has the consistency of coarse crumbs. You can do this in the bowl or on your work surface, using your fingertips or an implement of choice. 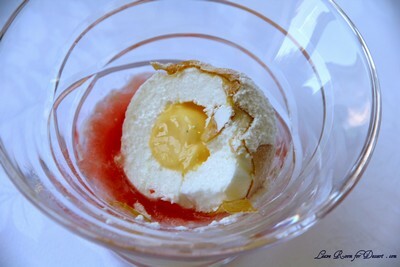 Make a well in the center of the mounded flour and butter mixture and pour the beaten eggs into it (reserve about a teaspoon of the egg mixture for glazing purposes later on – place in the refrigerator, covered, until ready to use). Add the lemon zest to your flour/butter/egg mixture. Use a fork to incorporate the liquid into the solid ingredients, and then use your fingertips. Knead lightly just until the dough comes together into a ball. 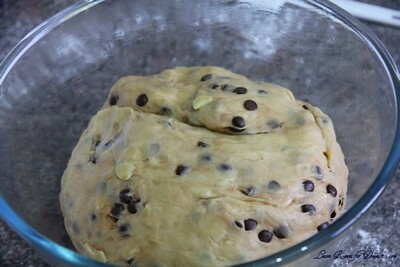 Shape the dough into a flat disk and wrap in plastic wrap. Place the dough in the refrigerator and chill for at least two hours. You can refrigerate the dough overnight. 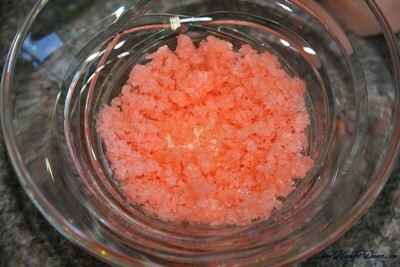 Put sugar, flour, salt, and lemon zest in the food processor and pulse a few times to mix. Add butter and pulse a few times, until the mixture has the consistency of coarse meal. See step 3 above and continue as explained in the following steps (minus the lemon zest, which you have already added). Heat milk in a saucepan until almost bubbling. Whisk eggs with caster sugar, then whisk in plain flour. 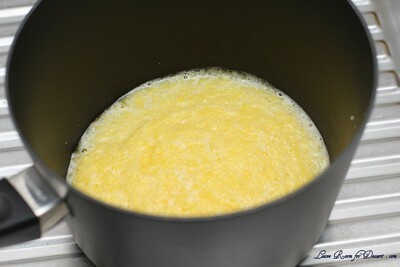 Slowly pour half the warm milk over the egg sugar mixture, mixing well to stop the eggs cooking. Pass the egg mixture through a sieve back into the saucepan. 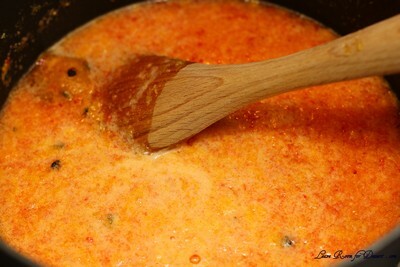 Place the saucepan back over medium heat and continue stirring the mixture until it bubbles. Pour the pastry cream into a bowl and place the bowl in a sink or bowl with cold or icy water, add the vanilla essence and stir the pastry cream until cooled. Refrigerate until cool. Heat the oven to 350ºF [180ºC/gas mark 4]. Take the pasta frolla out of the fridge, unwrap it and cut away ¼ of the dough. Reserve this dough to make the lattice top of the crostata. Refrigerate this dough while you work on the tart base. To help roll the crostata dough, keep the dough on top of the plastic wrap that you had it wrapped in. This can help rolling the dough and can also help when transferring the dough to your pan. You can also use parchment paper for this. However, you can also roll the dough directly on a work surface if you prefer. Lightly dust the top of the dough and your work surface (if you’re rolling directly on a work surface) with flour. Keep some flour handy to dust the dough as you go along. If the dough is very firm, start by pressing the dough with the rolling pin from the middle to each end, moving the rolling pin by a pin’s width each time; turn the dough 180 degrees and repeat; when it softens, start rolling. 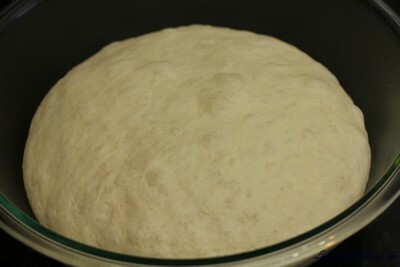 Roll the dough into a circle about 1/8th inch (3 mm) thick. If you used the plastic wrap or parchment paper as rolling surface, flip dough over the pan, centering it, and delicately press it all around so the corners are well covered. Peel away the plastic wrap. Trim the excess dough hanging over the edges of the pan. Press the remaining dough around the border into the sides of the pan making sure the border is an even thickness all the way around. Prick the bottom of the dough with a fork in several places. Take out of the fridge the reserved pasta frolla you had cut away earlier. Roll it with your pin and cut into strips or use cookie cutters to make small shapes (this is not traditional, but it looks cute); or roll with your hands into ropes. 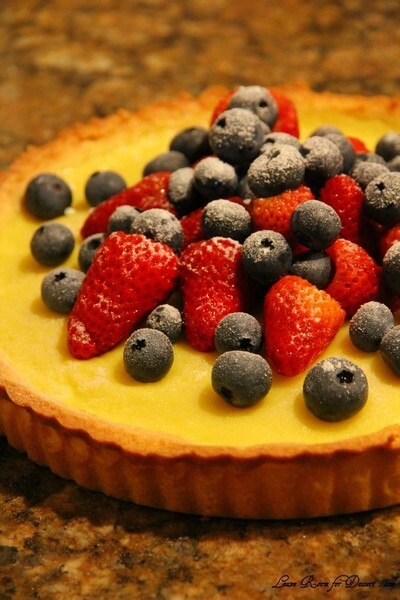 Instead of jam or fruit preserves, cover the bottom of the crostata crust evenly with the pastry cream. 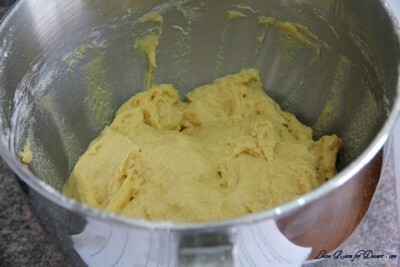 Brush the border and strips of dough with the reserved beaten eggs. You can add a drop or two of water to the beaten eggs if you don’t have enough liquid. Put the tart in the oven and bake for 30 minutes. When done, remove the tart from the oven and let cool. 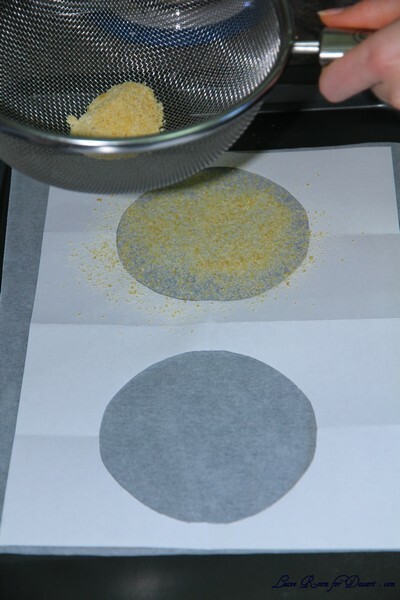 If you have used a tart pan with a removable bottom, then release the tart base from the fluted tart ring. 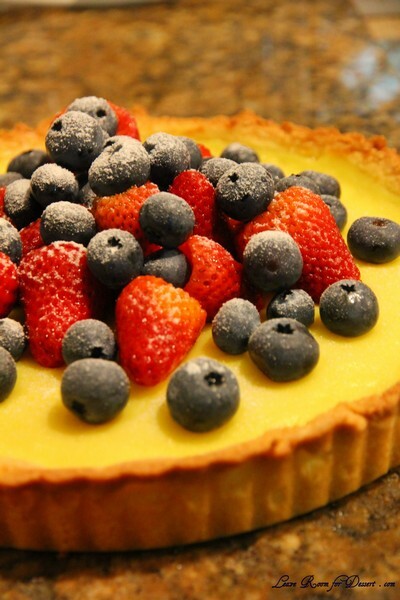 Make sure the tart is completely cool before slicing and serving. Asparagus is on a great special at the moment in the shops and is tasting fantastic too. I always like using fresh, seasonal ingredients, because not only do they have an amazing taste, they are likely to have traveled less distance to reach the shops, and are also a good price – which is important to most people. I have only just started getting into eating asparagus. 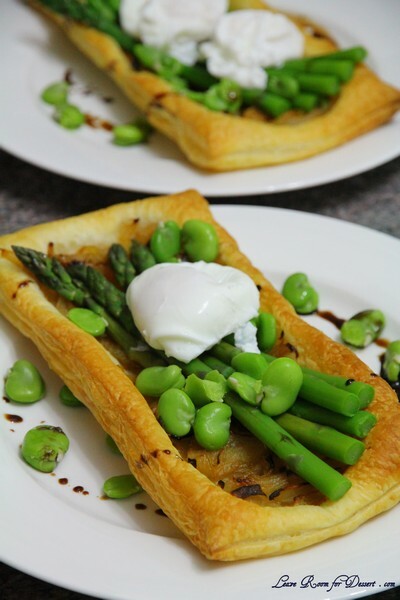 This year in particular has been one where my whole family is eating asparagus – and broad beans too. I now have broad beans with a lot of meals, although we are lucky if they make it to the plate – as I tend to eat them whilst shelling them. the water, then added the egg. The eggs came apart a bit whilst cooking, although stayed together enough – they cooked for 2-4 minutes and were then drained. Heat oil in a medium saucepan on high. Add the onion and salt, stir and turn the heat down to medium/low (alternating if need be to make sure the onions don’t burn). Cook for 10-20 minutes until the onions are caramelised. Place pastry halves on two lined baking trays. Divide the onion mix across the pastry halves, leaving a 2cm gap around the outside edges. Cook in the oven for 10-20 minutes until the pastry on the outside is puffed and golden brown. 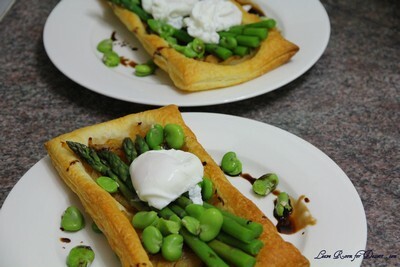 Whilst the tarts are cooking, poach the eggs (with the method I used above, or according to your preferred method), and cook the asparagus and broad beans. To cook the asparagus and broad beans, boil water in a medium saucepan. Place the broad beans in the water and cook for 2 minutes, or a little longer if they haven’t come to the surface of the water. Place in cold water straight away, to stop the cooking. Remove skins from the broad beans. Place the asparagus into the boiling water and cook for 2 minutes. Place in the cold water. 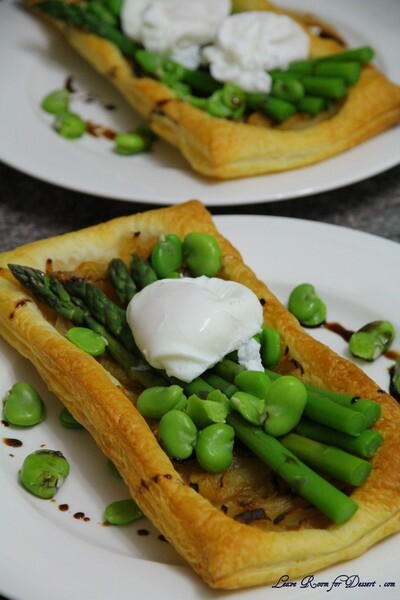 Rinse the broad beans and asparagus under a small amount of hot water, before draining and placing on top of the cooked onion tart. 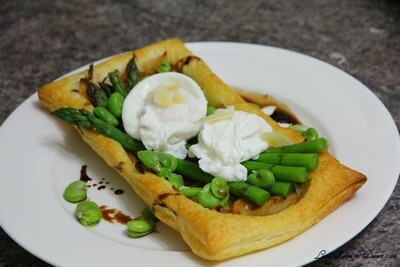 Top with 1-2 poached eggs per tart and drizzle caramelised balsamic vinegar around the edges. And then I saw it everywhere, even little searches brought me to his recipe, either posted by someone who went to Peter’s cooking class or even on a lifestyle website. Then it was the final dish to be prepared by MasterChef contestants in series 2. These tuilles were perfect! They worked very well on baking paper and hardly any broke. It also didn’t matter if they stayed on the paper a while. The other piece of equipment I was missing were the hemisphere moulds. 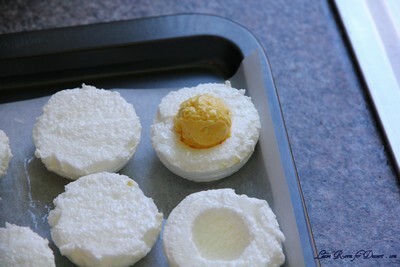 Although my Mum came up with the brillant idea of using an egg poacher for the meringue moulds. Lucky my mum’s one had smooth hemispheres compared to mine with a flat base. These worked perfectly, with the only problem being that there were only 4 moulds, so I had to clean them between cooking each batch of 4 halves. I made a total of 8 snow eggs, so this part got tedious after the 2nd batch. The flavours Peter uses are gorgeous, although trying to make this using seasonal fruits or frozen fruits I had on hand, made me change the recipe to suit the timing of the year. 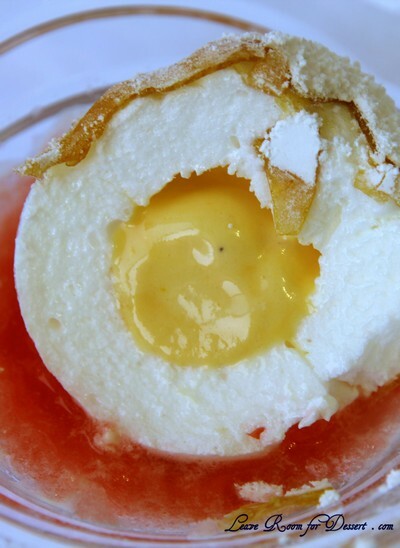 I decided on a passionfruit ice cream for the “yolk” of the egg, with a tropical, strawberry, pineapple and passion fruit granita along with a strawberry cream. I think most flavours worked wonderfully – although the strawberry cream was maybe a little overpowering in flavour. 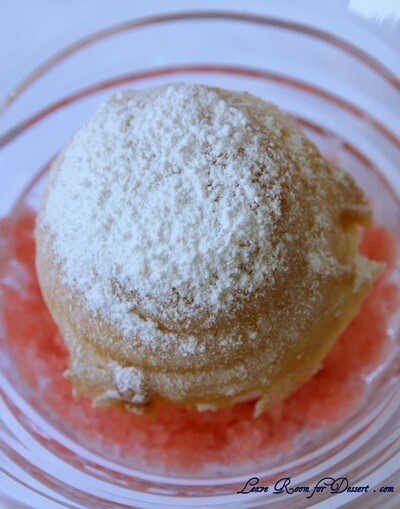 I have learnt so much from this challenge – the maltose experience was extremely interesting, as were making the poached meringue and granita. I am so glad I have made this, and even more glad the extremely talented and incredibly gifted Peter Gilmore shared such a beautiful recipe of his. I would much like to go back to Quay at some point as the experience was just amazing. I am also greatly anticipating the launch of his book on 1st November this year!!! I tried to make my own version of Peter Gilmore’s eight textured chocolate cake as I could not find his recipe anywhere – although it didn’t turn out particularly well in the presentation department (and obviously didn’t compare to the flavours of Peter’s, but was still delicious). I’m not sure whether I should post it due to the bad photos… – although I have heard his actual recipe may be in his book – making me super excited!! Preheat oven to 150ºC and turn on ice cream machine to chill. For the passion fruit ice cream, bring milk to the boil in a small saucepan. 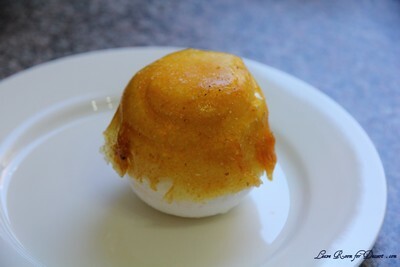 Whisk egg yolks and sugar together by hand, then pour boiling milk onto the egg yolk mixture while whisking. Pour into a stainless steel bowl and cook while whisking over a pot of simmering water for about 10 minutes or until it is thickened. 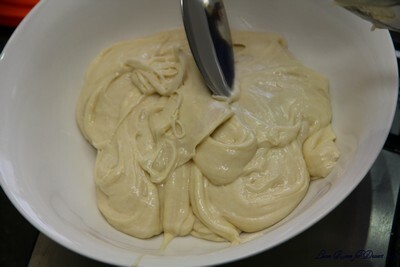 Whisk sabayon until cool over ice, then whisk in the passion fruit pulp and the cream. 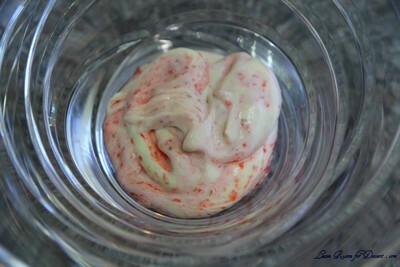 Strain and then place the mixture into an ice cream machine and churn for about 40 minutes. Place in the freezer until set. For the vanilla custard base, heat cream and vanilla seeds together in a small saucepan until it just begins to boil, and then remove from the heat. Whisk by hand the eggs, egg yolks and sugar together in a stainless steel bowl until combined. While whisking the eggs, slowly pour on the hot vanilla cream. Mix well and remove the vanilla pods. Pour this mixture into 4 dariole moulds to a depth of 5 cm, place the dariole moulds into a small baking dish with boiling water around the dariole moulds up to halfway to form a water bath. 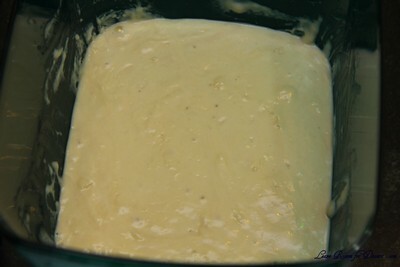 Place the water bath into a 150ºC oven and cook the custard 25 minutes or until the custard is just set. If the centre is still runny place in the freezer until set then place in refrigerator until needed. 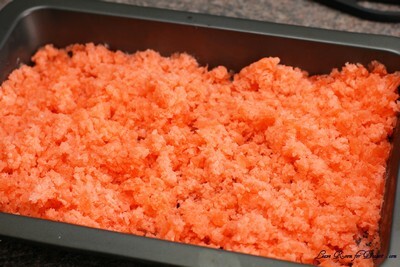 For the granita, combine sugar and water in a large saucepan; bring to the boil then lower heat. 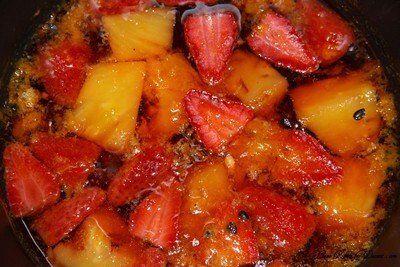 Add diced fruit and gently simmer for 10 minutes. Take off the heat and allow to infuse at room temperature for 30 minutes. Pass the liquid through a muslin cloth and discard the solids. Pour the syrup into a lamington or slice tin to a depth of 5cm. Place in the freezer until solid. 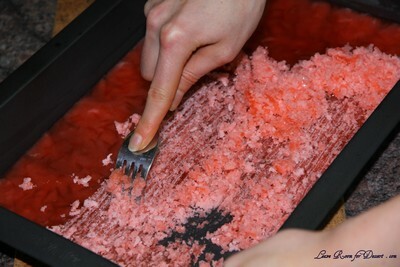 Scrape with a fork into crystals and then transfer to the freezer until required. For the poached meringue, whisk the egg whites in an electric mixer until they form soft peaks and then slowly add the sugar bit by bit. 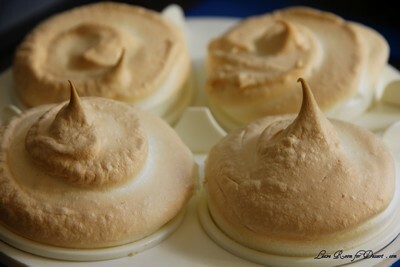 Keep whisking until the meringue forms firm peaks and the sugar has dissolved. Spray hemisphere moulds lightly with canola oil spray. Spoon mixture into a piping bag fitted with a 1cm nozzle. Pipe mixture into moulds so it sits above the surface. 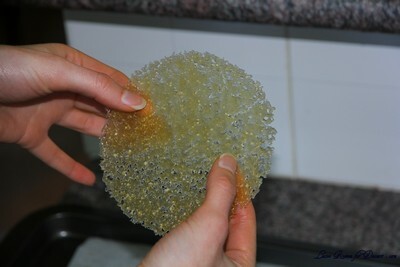 Place the filled moulds into a large baking dish and pour boiling water into the baking dish to a depth of about 3cm. Bake at 150ºC for 15 minutes until just. 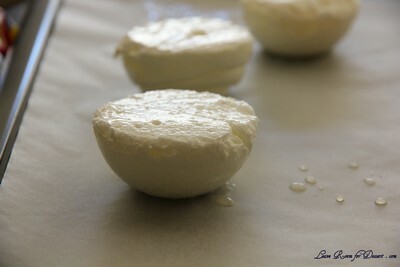 Allow to cool for 2 minutes, then trim off tops so they are perfect hemispheres. Gently un-mould and place cut side up on a baking paper lined tray in the fridge until needed. Increase oven temperature to 180ºC. 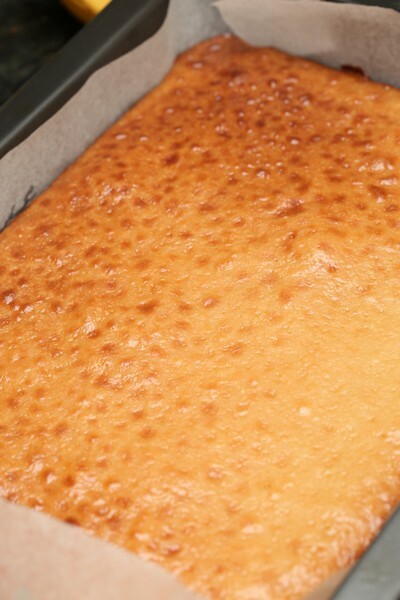 To make the maltose tuiles, stir maltose and sugar together in a small saucepan then bring to the boil until it reaches hard crack stage (until it caramelises) (this will occur at 160ºC or a little higher). Take care to brush down the sides with a pastry brush dipped in water so it doesn’t crystallise. 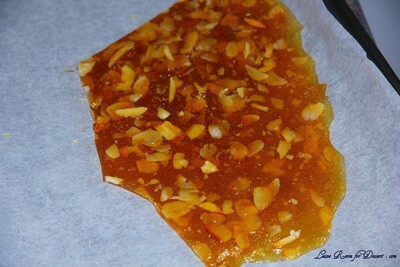 Once golden add the flaked almonds and immediately pour the mixture onto a silicon mat, allow to cool completely. Process the cooled praline in the bowl of a hand blender to form a fine powder. Next sift a fine layer of the praline mixture through a drum sieve, over an acetate stencil with 11cm circles cut out of it onto a silicon mat on a baking sheet. 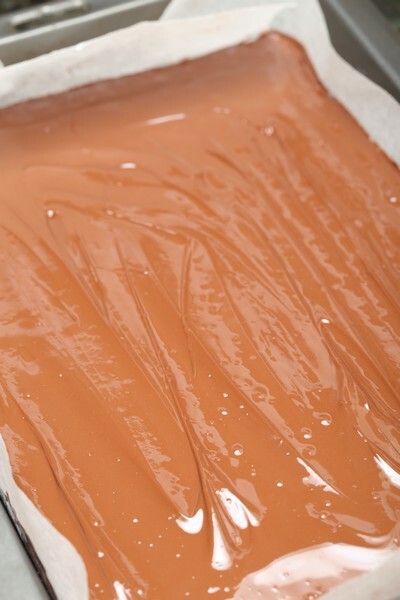 Melt this mixture in a 180ºC oven for a few minutes until it forms a clear liquid paste. Cool tuiles slightly and peel off silicon sheet while still flexible. Store flat between sheets of baking paper until ready to use. 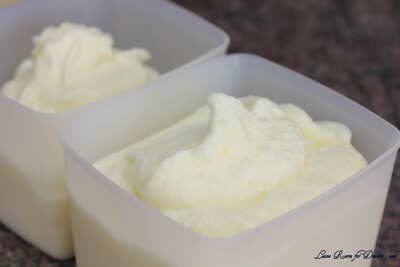 For the vanilla cream, whisk the cream and custard together to form soft peaks. Store in the fridge until ready to use. For the strawberry cream, place the strawberry puree in a small bowl and fold through the vanilla cream gently to form a rippled effect. Do this just before you are ready to assemble the dessert. To assemble, take 8 of the half hemisphere poached meringues. Using a teaspoon or half teaspoon measure remove a small scoop from the centre of each half hemisphere being careful not to break through the outer edge. 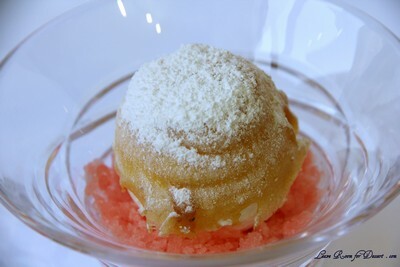 Then place a teaspoon or half teaspoon measure scoop of passion fruit ice cream in four of the hemispheres. 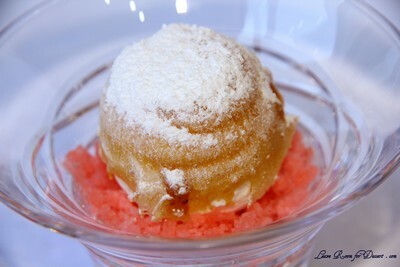 Invert the other four hemispheres over the ice cream filled meringues to form a complete sphere. Use wet fingers to stick the two halves together. 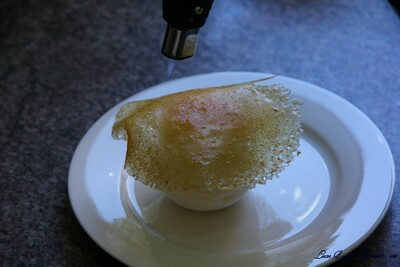 Place a tuile on top of each sphere and using a blow torch and an even motion, melt it over the sphere, patting it down if necessary. Dust spheres liberally with icing sugar. 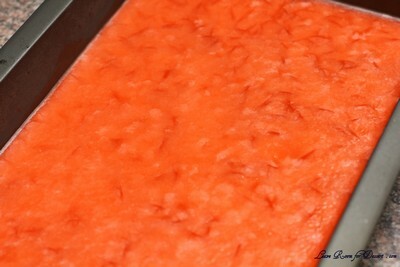 Next add a generous spoonful of the strawberry cream in the bottom of each serving glass. 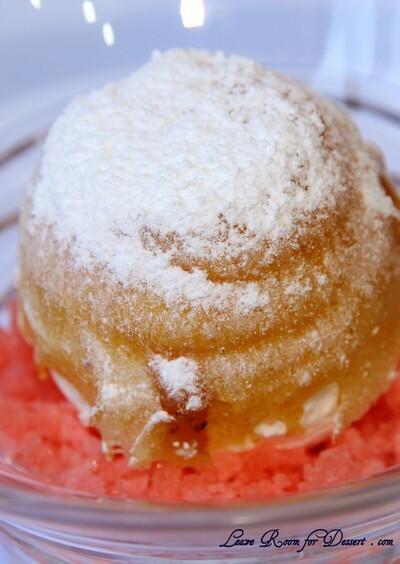 Top the cream with the tropical granita. 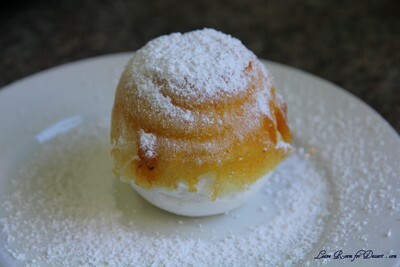 Use two teaspoons to place the snow egg on top of the granita and serve.